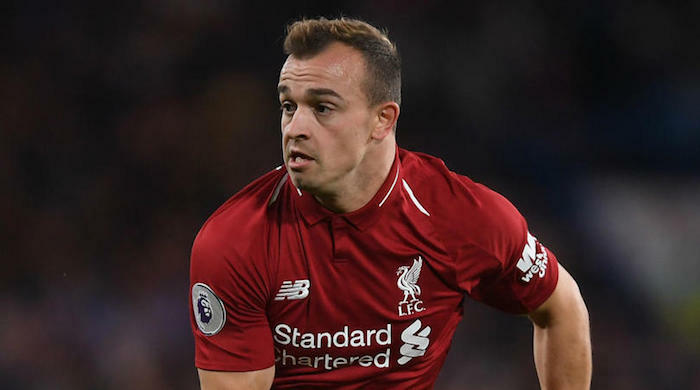 Xherdan Shaqiri has been omitted from the Liverpool squad for Tuesday’s Champions League clash with Red Star Belgrade. The 26-year-old was born in Kosovo, an ethnically Albanian province that fought a war of independence against Serbian-dominated Yugoslav forces in the late 1990s.The Serbian government refuses to recognise Kosovo’s independence. ‘It’s a situation where we will go to the fantastic city of Belgrade as a football team to play football,’ Klopp told Liverpool’s official website. ‘We have heard and read the speculation and talk about what kind of reception Shaq would receive and although we have no idea what would happen, we want to go there and be focused 100 per cent on football and not have to think about anything else, that’s all. ‘We are Liverpool, a big club, a football team but we don’t have any message further than that. We have no political message, absolutely not. We want the focus to be on a great game of football, free from anything else. ‘We are keen to be respectful and keen to avoid any distractions that would take focus away from a 90-minute-plus contest that is important for football and only football. So for that reason, Shaq is not involved and he accepts and understands this. Shaq is our player, we love him, and he will play for us a lot of times, but not on Tuesday. ‘I have heard so many wonderful things about the city of Belgrade, and the country of Serbia as a whole, from friends and colleagues who’ve visited before, so now I’m really looking forward to taking Liverpool there for a great game of Champions League football.